The thermostat is typical of the old mercury type thermostats, and also shows how a digital thermostat controls the unit, without the heating, programming, time delays, and solid state circuitry drawn in. I drew the dotted line around it to make it easier to explain to students that these are the switches in the thermostat, and that while the thermostat is electrically a part of the circuit, it's actually located on the wall in a room inside the building. 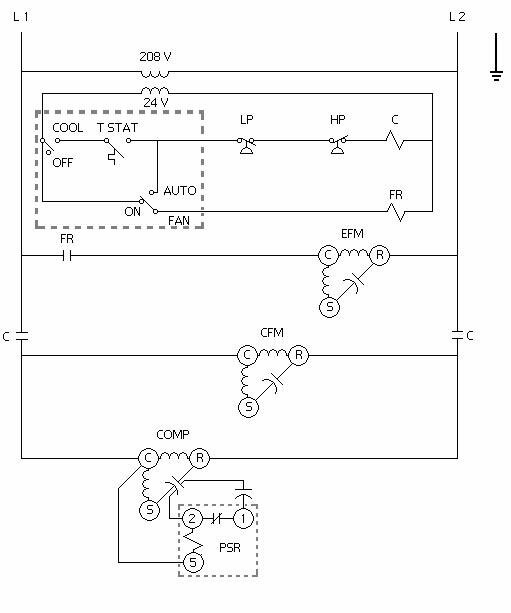 In this air conditioning schematic I also drew a dotted line around the potential start relay to make it easier to explain to students what it does, and how the switch opens and drops the start capacitor out of the circuit when counter emf energizes its coil. To read this schematic, start at the top, and go down line by line. The top line is the primary of the control transformer. If the breaker and disconnect are on and L1 and L2 are live, 208 volts will be applied to the primary. On the second line down, 24 volts will be induced in the secondary of the transformer, which is the source of the control voltage. On line three of this air conditioning schematic, lets say the room is warm, so the thermal switch (T STAT) contacts are closed. When we move the manual switch up to the 'Cool' position, 24 volts will flow through the 'Cool' switch, thermal switch, low pressure switch, and high pressure switch, and energize relay C (Contactor). At the same time, 24 volts has flowed through the fan-on contacts and energized relay FR (Fan Relay). And when relay FR is energized the FR contacts closed and energized the evaporator fan motor. In this air conditioning schematic, the compressor and condenser fan will continue to run until the manual switch is turned off, or the room cools down and the thermal switch contacts open, or either the low pressure or high pressure switch opens. The evaporator fan will run continuously if the fan switch is left in the 'On' position. If the evaporator fan switch is set in the 'Auto' position, the fan will run when the compressor runs, and turn off when the compressor turns off. If you're a technician looking for a factory air conditioning schematic for a piece of equipment you're working on, I'm guessing that there was no diagram on the inside of the unit's electrical cover, that there's no owner's manual or service manual available, and that the unit is complicated enough that wire by wire circuit tracing isn't feasible. If you own air conditioning or refrigeration machinery or are responsible for its maintenance and repairs, do everything in your power to get the service manuals, parts manuals, and wiring diagrams for your equipment. The more of this information you have for the repair technicians to use as a resource, the faster they can get your equipment repaired, which means you'll save money. Whatever your situation might be, call your local distributor and ask for the information, go to the manufacturer's web sites to search for the information, and get the phone numbers for customer service off the web sites and call and fax them and ask how you can get the information. I hope this page has helped; and please, feel free to contact us with any specific HVAC questions you might have, including questions about air conditioning on Guam, or refrigeration on Guam. Return from Air Conditioning Schematic to the Air Conditioning and Refrigeration Guide home page.